A very important change to the Proceedings this year is that all submissions must be made using the Online Journal System (OJS), the platform ATLA now uses to publish the Proceedings. Email submissions will not be accepted. Instructions for submitting your materials to the Proceedings may be found at https://serials.atla.com/proceedings/about/submissions. We have also prepared a brief video tutorial on how to submit your paper to the Proceedings at https://vimeo.com/270745239. For more information on who should submit to the Yearbook as well as instructions on submission, please visit https://serials.atla.com/yearbook/about/submissions. If you believe that your paper would be within the scope and of interest of readers of one of ATLA’s other publications, such as Theological Librarianship, please let me know prior to submitting your work to the Proceedings and we can discuss the procedure for submission to one of those other publications. The deadline for submissions to the Proceedings as well as the new Yearbook is September 28, 2018. Early submissions are encouraged. If you have questions about the Proceedings, please don’t hesitate to get in touch with me. 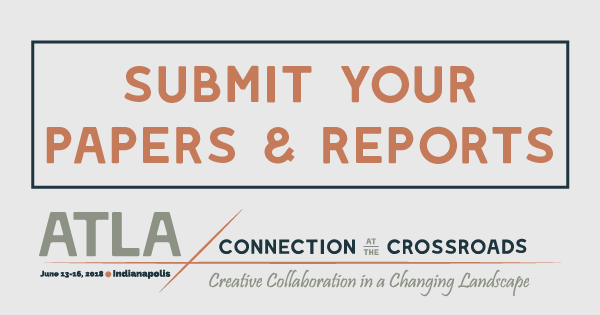 Questions about submissions to the Yearbook should be directed to memberrep@atla.com.